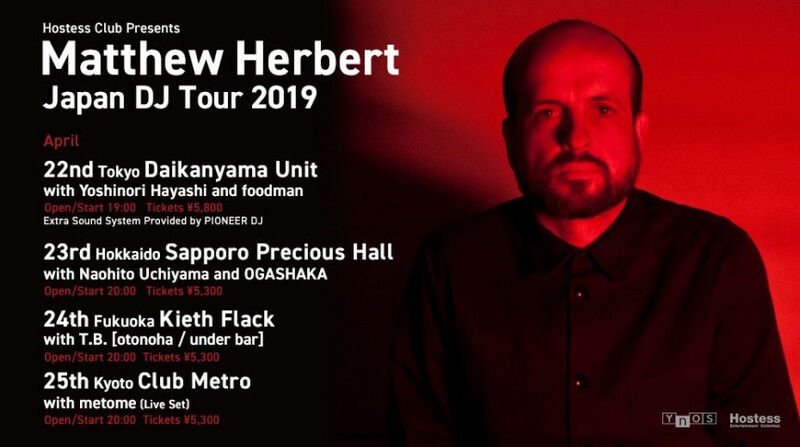 After having played at the Hostess Weekender event as a resident DJ, one of Britain’s most renowned electronic sound producers Matthew Herbert is returning to Japan. Following 2008’s masterpiece There’s Me and There’s You, The Matthew Herbert Big Band will release a new album this March. The album concept is topical and deals with the theme of Brexit. This is an opportunity to enjoy his new sounds with an added sound system (provided by PIONEER DJ). Don’t miss out on his first Japan tour in 10 years. Japanese DJs Yoshinori Hayashi and Foodman will be supporting on this special night.